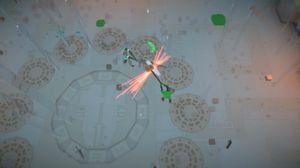 Auckland-based indie studio Frogshark has announced Swordy, a brawler that takes physics a little more seriously than most games in the genre. 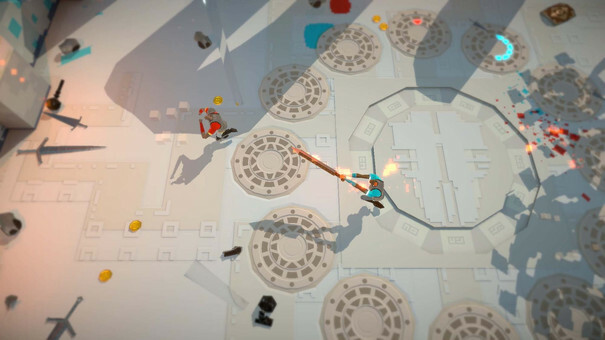 Swordy pits a number of friends against one another in local multiplayer melee battles where all movements – including attacks – have a weight, acceleration, and momentum. Weapon swings are executed using the right stick, with damage proportional to the weapon’s momentum. Similarly, weapons may be thrown by swinging them around and then letting them go. “If I whack you really hard with a hammer it could be a one hit kill, but if I tap you with a sword it won’t do as much damage,” said Frogshark co-founder and programmer Hamish MacDonald. “There’s a lot of nuance in how you do those actions. By doing a spin with aiming, you can get the lean to add a whole bunch more momentum into a swing." Players go at it with knives, swords, longswords, hammers, and flails, with a super-heavy great hammer and staff also likely to be included once properly balanced. “We’ve moved a bit more towards the medieval, but our main interest is towards the tribal,” said MacDonald. 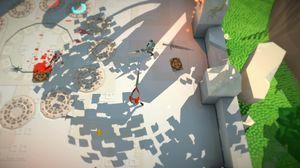 Frogshark’s three developers built Swordy as they wanted something to play together with their friends and family, said MacDonald. “We wanted to focus on being able to express ourselves through the characters – that human feeling of analogue input rather than binary buttons, if that makes sense,” he said. At Frogshark, Alexey Botkov is the sound guy, Danny Lawrie mainly does the game’s art, and MacDonald handles the programming, “but we definitely have overlap in every area”, said MacDonald. The trio formed Frogshark earlier this year, and are working on Swordy in their spare time in order to showcase it at PAX AU later this year. As such, the current focus on deathmatch, but the team are keen to develop a horde-style co-op mode and perhaps later a co-op roguelike adventure mode. It’s unlikely the game will get online support, however. “It’s something that I’d definitely like to do, but it’s just not looking like we can in the forseeable future,” said MacDonald. 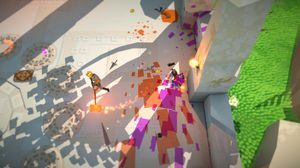 “That’s partly because – much like Towerfall – the action is really fast-paced so any kind of lag is going to put you at a disadvantage. But also the physics make it complicated. Swordy is being developed on PC using the Unity Engine. Other platforms are likely. “Consoles make perfect sense,” said MacDonald. 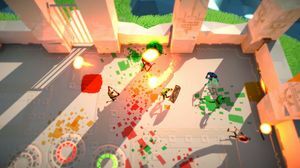 "That lounge local-multiplayer setting is perfect for Swordy"
The game can technically support 10 players at once, although screen size is the limiting factor. “We did a test with six and it was crazy fun,” said MacDonald. You can follow FrogShark on Twitter, Facebook, YouTube, Google+, and Tumblr, or just pay their website or the Swordy website a visit. Kiwi brawler coming to XO. Parity clause might be history. Kiwi brawler to feature at Indiecade.